Brick-And-Mortar Bookstores Play The Print Card Against Amazon When Amazon revamped its publishing wing, a lot of booksellers said enough is enough: They refused to stock Amazon Publishing's books, and Barnes & Noble followed suit. Now, with the departure of a star talent and some book releases that fell flat, many say Amazon Publishing may in trouble. 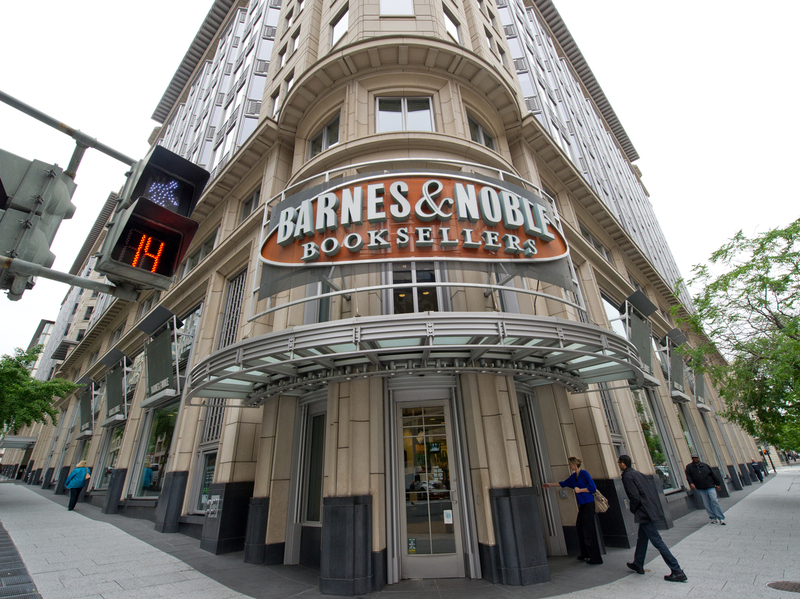 Barnes & Noble is one of several stores that have refused to carry Amazon Publishing's books. When it comes to book publishing, all we ever seem to hear about is online sales, the growth of e-books and the latest version of a digital book reader. But the fact is, only 20 percent of the book market is e-books; it's still dominated by print. And a recent standoff in the book business shows how good old-fashioned, brick-and-mortar bookstores are still trying to wield their influence in the industry. You might even call it brick-and-mortar booksellers' revenge. At the center of this story is Amazon, and it's no secret that there's little love lost between the traditional book world and the giant online retailer: Publishers and booksellers think Amazon wants to put them out of business. When the Justice Department brought suit against Apple and five major publishing companies for price fixing, a lot of people in the book business were apoplectic: They firmly believe that if an antitrust lawsuit should be brought against anyone, it's Amazon. So many within the industry are happy to look for any weakness they can find when it comes to Amazon. Recently, they found it in Amazon's decision to not just sell books, but also publish them. About two years ago, Amazon hired a well-known literary agent, Larry Kirshbaum, to launch the New York branch of their fledgling publishing business, which until then had been based in Seattle. This was seen as a big move because New York is the capital of the publishing business, and Kirshbaum was a major player there. Everyone figured he could use his clout to attract big-time authors to Amazon's trade publishing brand, and everyone was watching very closely to see what happened. Book News: Amazon's Kindle MatchBook Is Out — Will Publishers Opt In? And that's where the revenge part of this story comes in. A lot of booksellers said enough is enough: Not only is Amazon trying to take over the retail side of the book business, it's also going to take over publishing? Some independent bookstores decided they wouldn't carry Amazon Publishing's books and, even more importantly, Barnes & Noble — the country's biggest bookstore chain — and some big-box stores followed suit. Neither Amazon nor its authors expected that kind of backlash, and a couple of pretty big Amazon releases never really took off. That's where things stood last week when the news broke that Kirshbaum was leaving Amazon to become a literary agent again. His departure was widely viewed as a sign that Amazon Publishing could be in trouble, done in by the likes of Barnes & Noble. Amazon quickly stepped in to say that reports of the demise — or near demise — of its publishing business were greatly exaggerated. In fact, Amazon says it plans to expand its New York business. But powerful as it may be, some writers really do want to see their books on the shelves of certain stores. And those authors might be inclined to stick with traditional publishers. So, even in this digital day and age, the bookstore still has some clout.